As my grand trip to Europe nears its essential for me to put together an itinerary for my four country adventure. I originally purchased a simple three-ring binder and filled it with transparencies and colorful dividers. However, even though I decorated nicely it was simply too large to fit in neatly in my carry on and it was easily ended and it simply did not make sense to have to take a giant binder on my trip and a separate wallet for my cash and passport. Luckily, I found The Travel Org; a leather zipped organizer with multiple pockets for everything that I will be need on my trip. This one organizer took the role of my binder and wallet and mixed together perfectly, making it easier and more comfortable to travel with and let’s face it more stylish then my tacky green binder. 1. Perfectly fit and organize your visas, credits cards and IDs. The Travel Org has 7 slots for all your major cards. I was able to easily add all my credit cards, medical insurance card and even my Starbucks gift card. 2. Keep your travel currency safe. Right underneath your card slots is a zippered section for all your foreign currency, it’s an easy way to keep your money separate and not mix your coins or bills. 3. Take your iPod without having to scramble looking for it in your bag. There is pencil like case inside the organizer that is perfect for your IPod,earphones and any other small items you wish to take with you. I am a huge word search fan, especially when I travel and this would be the ideal spot to fit my booklet. This is my favorite feature of The Travel Org, I was able to include my flight, hotel and touring information in a detailed itinerary without the hassle of having to take my three-ring binder. Now my sheets won’t fold and I have all the information I need in one place. If you are hyper organized like me, this will change the way you travel forever. The Travel Org includes 15 inserts. You can double it, leaving room for 30 sheets. However, if you would like to add more inserts, you can purchase additional ones from their site. I was able to fit my two week itinerary using only 6 inserts. So I still have plenty left to add any other forms or even keep my boarding pass in there for safe keeping. 5. Need a safe place for business cards or family photos? Behind all your insert sheets you will find one final insert divided into four slots perfect for adding business cards or even family photos. OR if you’re into collecting cards from the places you visit, this is the perfect to place to keep them. 6. There is a place for your keys too. One of the many pockets The Travel Org features includes a spot for your keys. You don’t want to be locked out of your home on the way back. 7. A place for your home currency. As mentioned earlier there is a specific spot for foreign currency, well there is also a spot for your home currency. This is ideal for keeping things separate making it easier for purchases and for exchanging currency. 8. A safe place for your passport. The Travel Org would not be complete without a special spot for your passport. It’s located on the back side of the organizer, the expandable and zippered section of the organizer is not only for your passport but for boarding passes, brochures , etc. 9. You can also fit your iPad inside. 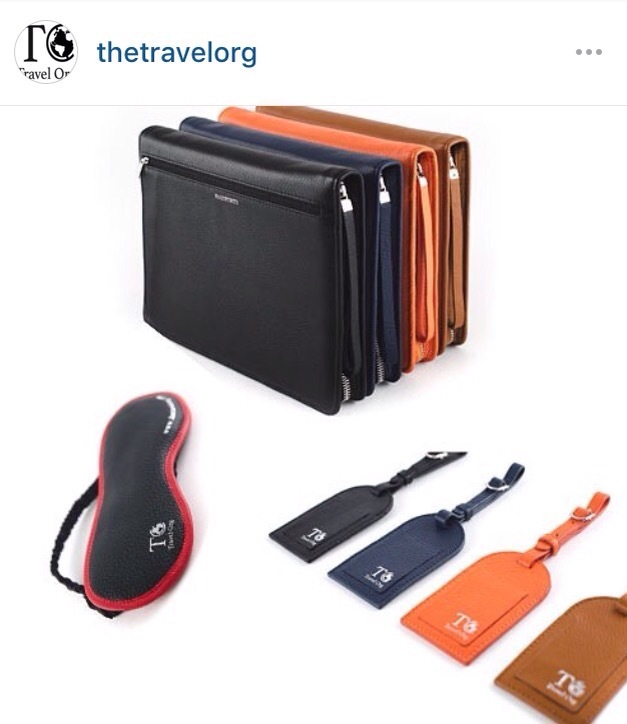 The Travel Org, is the perfect size for traveling comfortably but also big enough to keep you iPad in a safe place. The leather organizer is simple and classic. Its easy to pair with bags, luggage, carry-ons and even your favorite pair of shoes or coat. It’s ideal for men and for women whether your traveling for business or for pleasure. 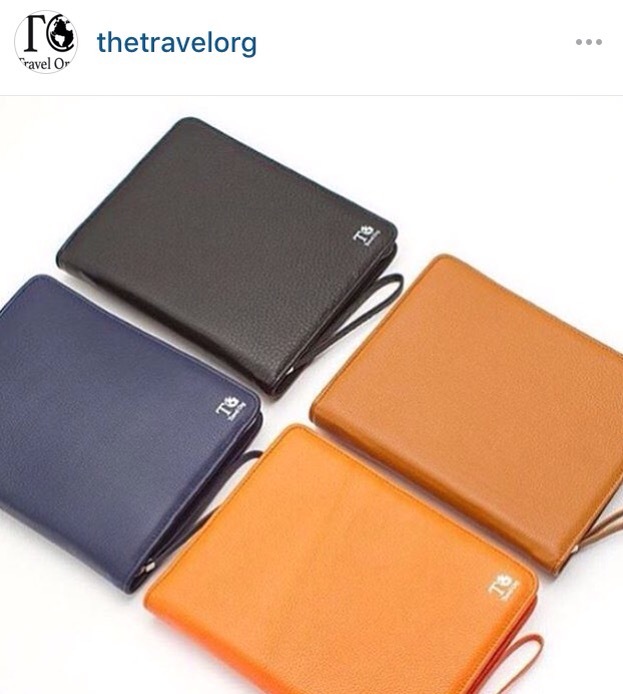 The Travel Org comes in four colors: black, blue, orange and tan. Can’t get enough of The Travel Org? Hope this helped all my fellow travelers and I can’t wait to post more of this little baby in action!